Large-scale solar power plants are now economic in Oregon. This is one of the surprising findings of the Oregon Solar Energy Industries Association’s recently published “Vision to Integrate Solar in Oregon” (VISOR). Produced by Chris Robertson & Associates, LLC, with support from the Bonneville Environmental Foundation, the VISOR study can be accessed at our publications page. The cost of producing solar electricity from large-scale power plants is less than the regulated avoided costs of the two largest electric utilities in the state (Portland General Electric and PacifiCorp). The Oregon Public Utility Commission regulates their avoided costs, which are published as part of the utility rate schedules. Power plant owners can get long term contracts to sell solar energy to the utilities at the avoided cost rates. Solar power plants would be even more profitable to build if plant owners were paid for the non-energy benefits their PV power plants create. Many benefits to the utility system are not now priced, but nevertheless are real. Here are three (of many) examples. A fleet of PV power plants would reduce risk of electric price volatility associated with natural gas generation and the region’s hydroelectric system. The three-phase inverters in PV power plants can provide valuable power factor correction services to the power grid. And avoided carbon emissions alone could be worth $20 or more per megawatt-hour, as the following chart illustrates. The new reality of cost-effective solar energy power plants caught many in the Northwest’s energy policy community by surprise. The influential Northwest Power and Conservation Council’s 2010 regional power plan regarded utility scale PV as not cost-effective by a wide margin; by the end of 2012 their 2010 forecast of PV capital cost was too high by a factor of five. The conventional wisdom is changing in response to new market research. As this new awareness of PV economics grows, the regions electric power institutions will need to adapt their planning models and management strategy to accommodate a growing solar resource. The new solar economics means that the power system will be challenged to integrate a growing solar resource into the grid. 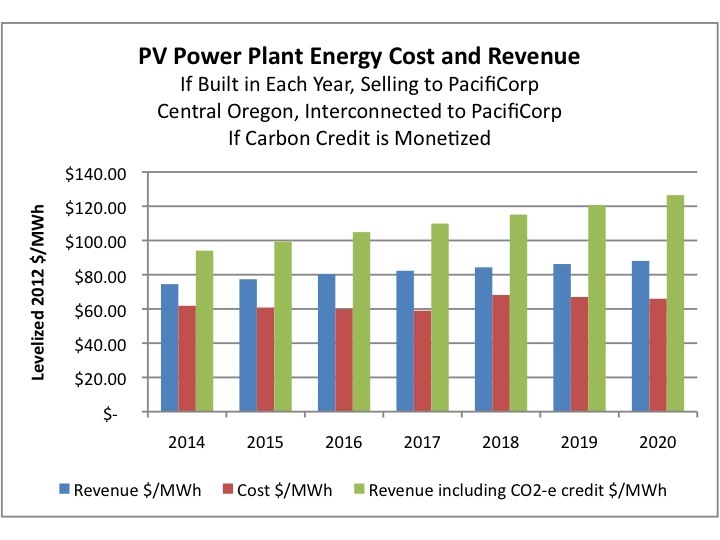 This chart illustrates the economic performance of a solar power plant built in Central Oregon and interconnected to PacifiCorp’s transmission and distribution system. The energy would be sold to PacifiCorp via a long-term power purchase agreement (PPA). PPA revenue is based on the utility’s 2012 avoided cost rates as regulated by the Oregon PUC. The levelized $/MWh is shown for the production cost (red bars), PPA revenue (blue bars) and PPA revenue plus the value of avoided carbon emissions (green bars). For more on Oregon solar energy strategy please download the VISOR report. Check out About for an overview of our consulting services.